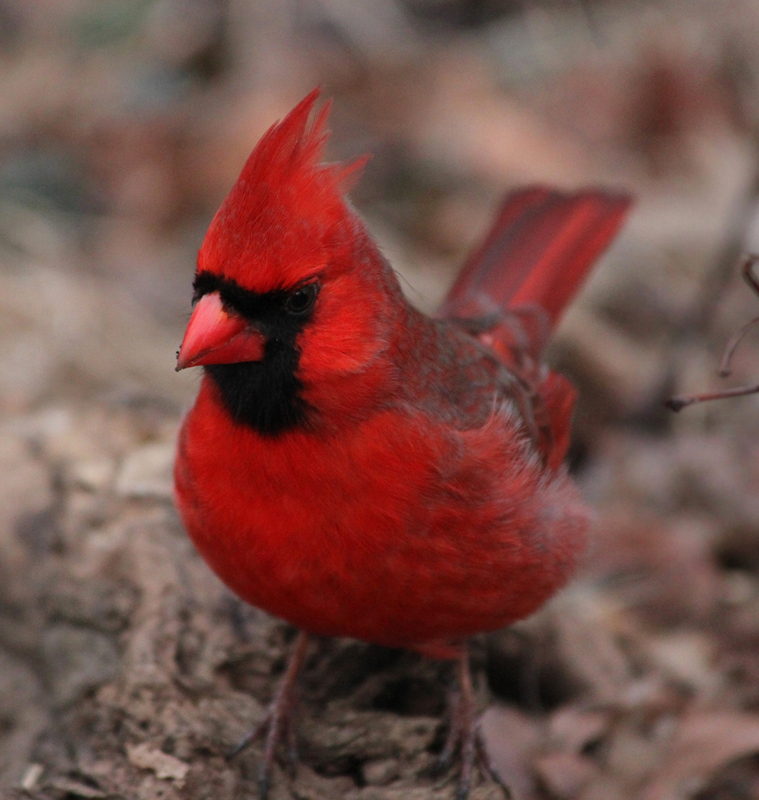 The original Angry Bird, a male cardinal in Central Park. Everyone loves cardinals, but I always think there's something endearingly goofy about them. Maybe it's that tuft of hair, which always reminds me of the troll dolls we had as kids, and is not something any animal aspiring to be taken seriously would ever sport. It's time for them to grow? 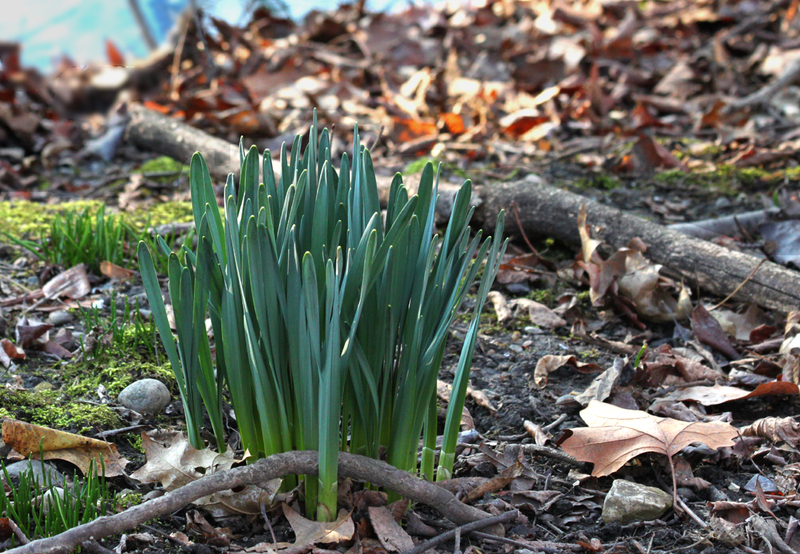 Crocuses and daffodils are starting to come out, much too early, fooled like the rest of us by this warm winter. If it freezes again they'll die, so now I'm hoping the warm weather stays, wrong as it feels. The October blizzard did so much damage, killed so many hundreds of trees, that I think we deserve an uneventful, if premature, spring. 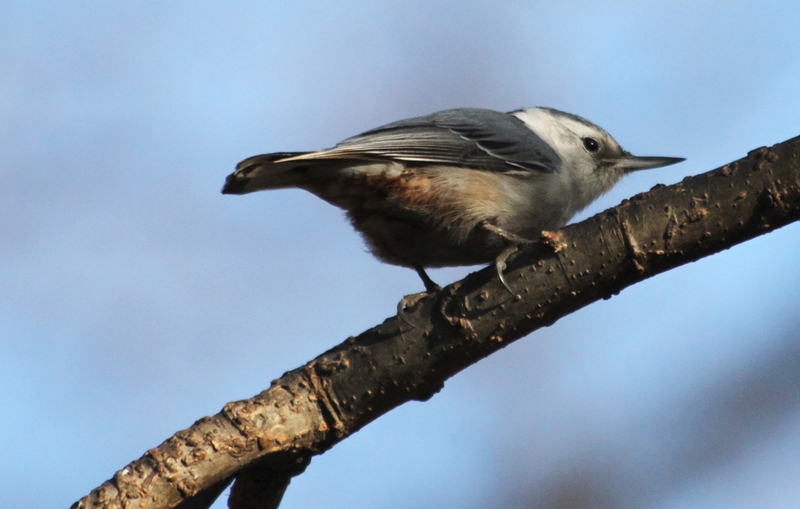 A white-breasted nuthatch in Central Park yesterday. 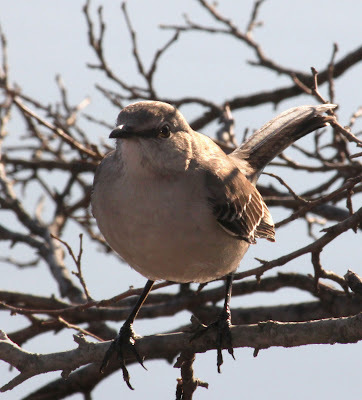 But I don't think there are infinite safaris in my future, so I will only get one chance to capture the birds of southern Africa, and it would be nice if I actually knew what I was doing. So I'm practicing, partly inspired by the amazing photos in the bird groups on Flickr. 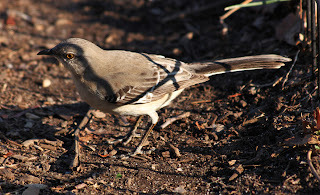 I want to be able to take razor sharp pictures of birds in flight, but I will settle for being able to take reliable shots of birds sitting on branches in plain sight. That's how I happened to take the photo on the right. 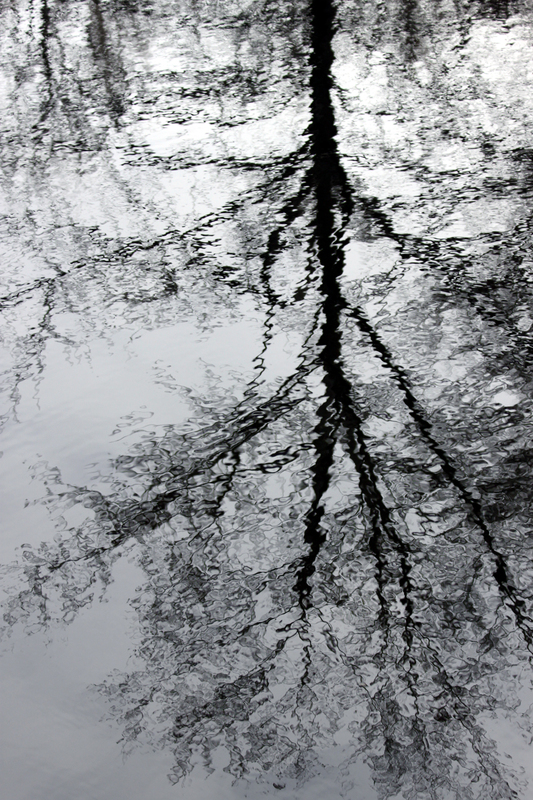 It's not nearly as clear as I would like but it captures the whole "Gravity? I sneer at your gravity!" 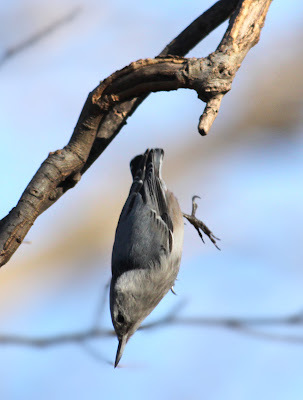 attitude of the nuthatch. They crawl along branches upside down, they hang like little bats, and they dive bomb from one branch to another without even bothering to flap their wings. 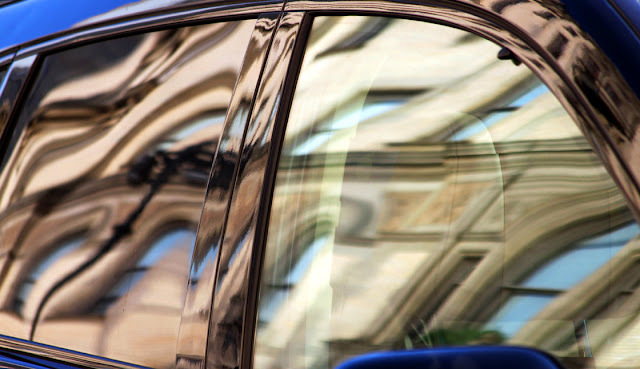 An apartment building on Central Park West reflected in the windows of a passing car. 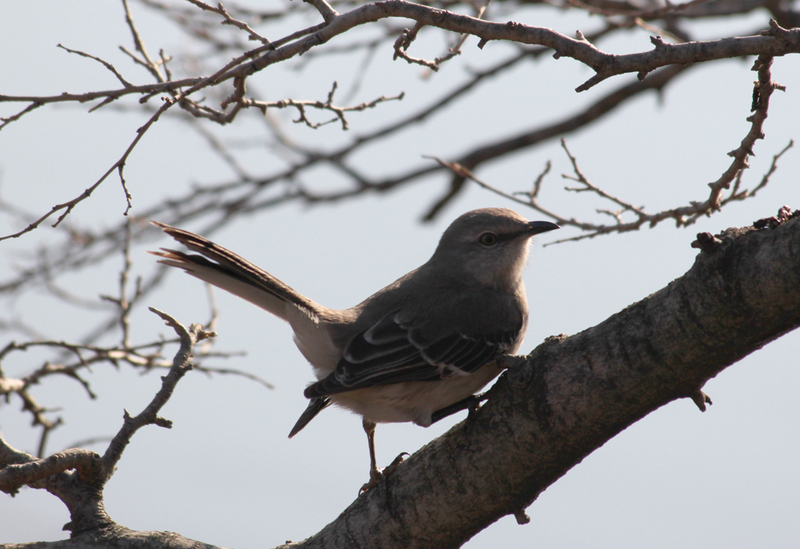 Another picture of the mockingbird from last week. The light's still wrong, but I like this picture because you can get a good look at the very powerful feet and claws these cute little birds are equipped with. I think you can see the dinosaur ancestry there, and we should be grateful that we are so much bigger than they are. I've been recuperating from a stomach virus most of the week, which has left me feeling like something the tide washed in. 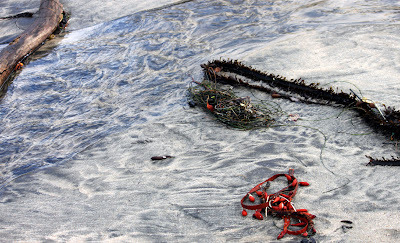 Which reminded me of this picture, jetsam on the beach in Half Moon Bay last November. 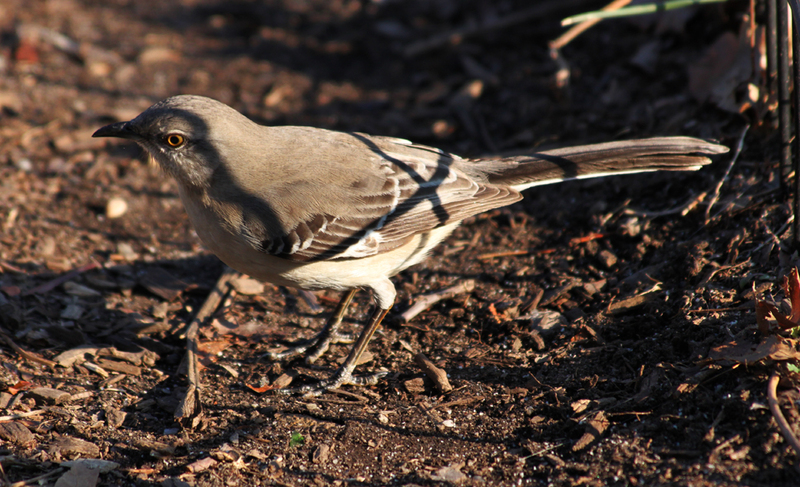 Mockingbirds sound much more interesting than they look, but when they pause with their tails up as in the photo above, they look quite jaunty. Unfortunately, it's Murphy's law in bird photography that if a bird is in plain view doing something cute, the sun will be behind it. And if they move into the sun, they will no longer look so cute. 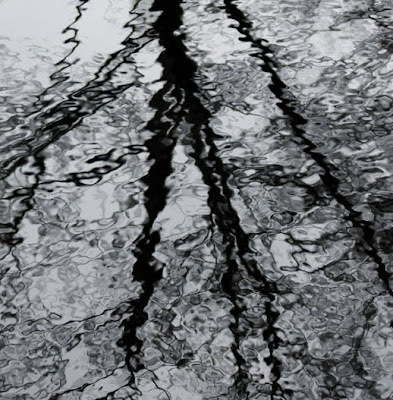 Winter is making a half-assed attempt to assert itself this morning, with a few flurries that are melting as soon as they hit the ground, so here's an appropriate reflection, of a bare tree in Central Park lake. Blogger unfortunately no longer has that cool feature where clicking on an image lets you zoom in, because the reflection gets beautifully abstract in detail. Clicking on the closeup below will give you an idea. Here's a change of pace -- no birds, no windows -- just the pleasing curves of the park benches in Strawberry Fields in Central Park. 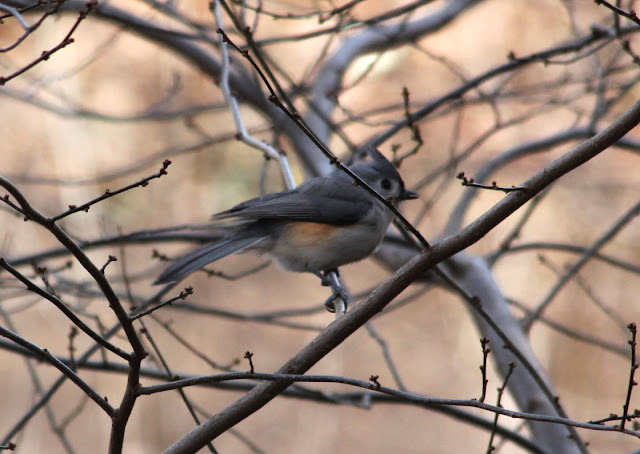 Not a very sharp photo, but the best I've ever managed to get of a tufted titmouse. Apart from having a name that's fun to say -- tufted titmouse! -- these birds are just so freaking adorable I sometimes suspect that they're not really animals at all but escapees from some Disney 3D animation project, and any minute an animatronic Bambi is going to come frolicking out of the trees beneath. 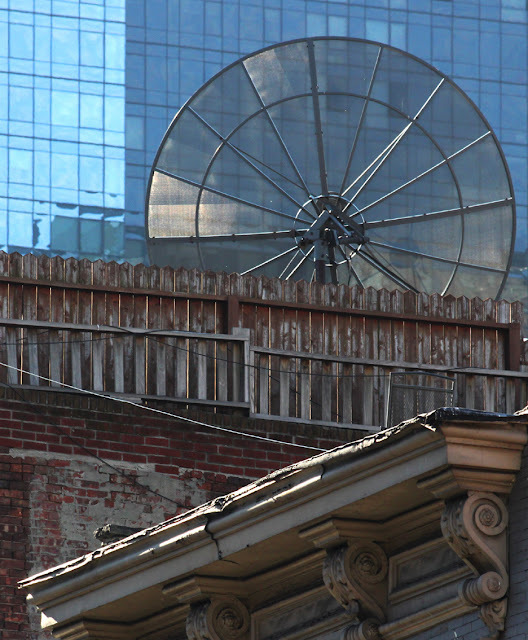 I'm not sure what this is -- some kind of enormous antenna on top of an old low-rise building on Ninth Avenue in Manhattan. 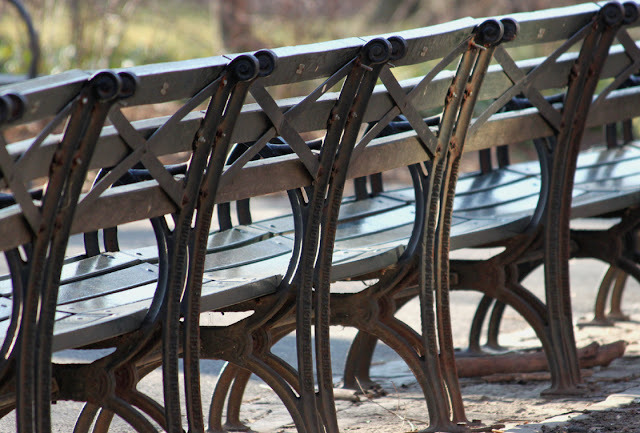 Or, more accurately, I'm not sure what it's listening for. Radio signals? 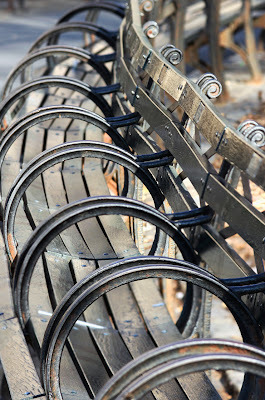 Messages from aliens?